Many books promise great things, maybe have wonderful language, characters you don’t want to part with, a landscape you just know you’ve been to in another life. But also, many fail to deliver at the end. After eagerly turning pages for whatever reason, I’m very often left with a feeling of anti-climax. Is that it? But what about......? and how did....? 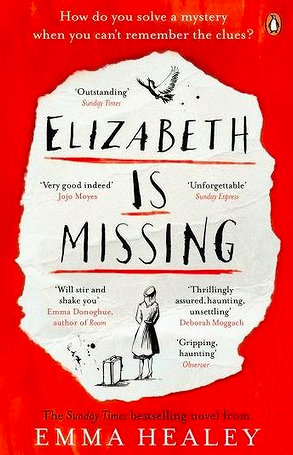 So Emma Healey’s debut novel, Elizabeth is Missing made me want to instantly thrust it on a friend, an acquaintance, anybody - urging them to read it at once. Andrea Gillies, in The Guardian, called it “brilliant and unconvincing”. She was unhappy with what she perceived as an inconsistent voice as Maud, the 84 year old dementing protagonist, dithers and forgets, repeats things and makes a nuisance of herself while her internal voice is lucid and at all times engaging. There are parallel stories here - Maud’s current anxious search for her old friend Elizabeth, whom she believes is missing, and her struggle to make sense of the disappearance of her sister Sukey seventy years ago. The fragments segue repeatedly into each other as Maud’s memory does its ragged dance between now and then, Elizabeth and Sukey, certainty and confusion. What I found so impressive was that this really seemed to be a documentation of dementia from the inside (not that I’d know, yet.) But the author takes us convincingly into the mind of Maud so that we live her frightening frustrations and her confusions, then instantly become weak with sympathy for Maud’s stoic daughter Helen who just can’t keep up with the twists and turns inside Maud’s mind that lead her to do the things she does. Okay, the resolution may be just a little bit easy, but well worth it to see Maud vindicated in at least one aspect of her quest. I could not bring myself to quibble about this as an ending. It satisfied me. The thing is, it would have been so easy for Emma Healey to write her first novel about a beautiful 20-something woman living in London - which she is; plenty of scope there. But how much more admirable to have nurtured the seed of an idea, undertaken the research and the interviews, collected the stories and then fed all this into her imagination so successfully to invent Maud. I have not yet finished reading Elizabeth is Missing but I can already tell I will miss being involved with Maud and the mysteries in her life. Emma Healey has me bewitched with her writing style. Her ability to create the internal dialogue of a woman struggling with memory loss is stunningly brilliant in my opinion. I was relieved to read in your review that the resolution was satisfying. Now I have the chance to sit down to listen to Maud again while dinner is cooking. I hope she finally gets that cup of tea! It's a bit of a shame that the books we love don't last longer isn't it. Perhaps I really should start on The Game of Thrones as a friend, whose word I usually trust, recommends?